I finished this a few weeks ago, but I thought it was about time I posted it. The picture isn’t as nice as I had hoped because I had to use the flash which seems to over expose everything. 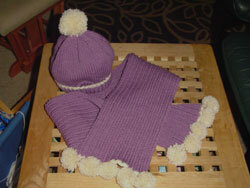 I love the little pom poms on the scarf although I wasn’t too happy about making all ten of them. Little G’s scarf is well on it way to being done. Then it’s the mittens which I either need to find a pattern for or as usual make my own. I will have to add the whole set as a free pattern when I’m done. I’ve haven’t added a new pattern for awhile. In fact I’ve been feeling a little out of the knitting world lately. I’m off to do some knitting now so that should help solve that problem. Very sweet. Those pompons were worth the effort. That purple will look so nice with G’s beautiful blue eyes. Good job Mommy!